Mat & Danielle from the Exploring Alternatives YouTube Channel recently posted news of their visit with Kate & Simon Cabane, the creators of this Scandinavian-style tiny house. It’s a 20-foot tiny house on wheels that’s currently located off-grid in Quebec, Canada. It has a fully functional kitchen with a full size sink, mini gas range, and apartment sized refrigerator. A tiny wood stove provides heat. In the bathroom is a small shower, sink, and composting toilet. Up in the loft is a queen size bed and it’s accessed by a fixed ladder with deep stair-like steps. Kate & Simon also build tiny homes, so if you like how this looks and want one too, visit the Cabane Website. The website is in French, so if you need it translated try using the Google Chrome web browser. Chrome can translate it for you in real time. Mat & Danielle have posted many tiny house tours and interviews on their Exploring Alternatives YouTube Channel. Be sure to subscribe, you won’t want to miss an episode. Photo above via the Exploring Alternatives video. 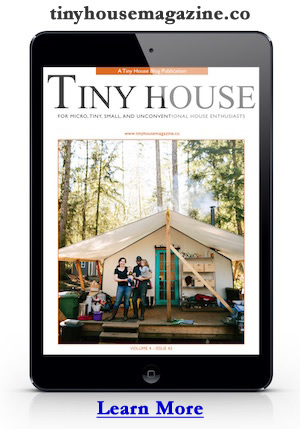 This entry was posted in Builders and tagged canada, Danielle, Exploring Alternatives, interviews, Kate Cabane, Mat, Quebec, Simon Cabane, Tiny House Tour.